Jump for joy!! The conclusion of the Moonlight mini-series is finally here!! You can now buy part 4 by clicking here. You can also pre-order the paperback copy of The Melanie King Affair, which has all 4 parts plus new chapters and a final conclusion from Warren’s perspective. This entry was posted in Lisa Sumil and tagged lisa sumil, melanie king afair, melanie king affair, moonlight. Bookmark the permalink. Free Download of Moonlight tonight! 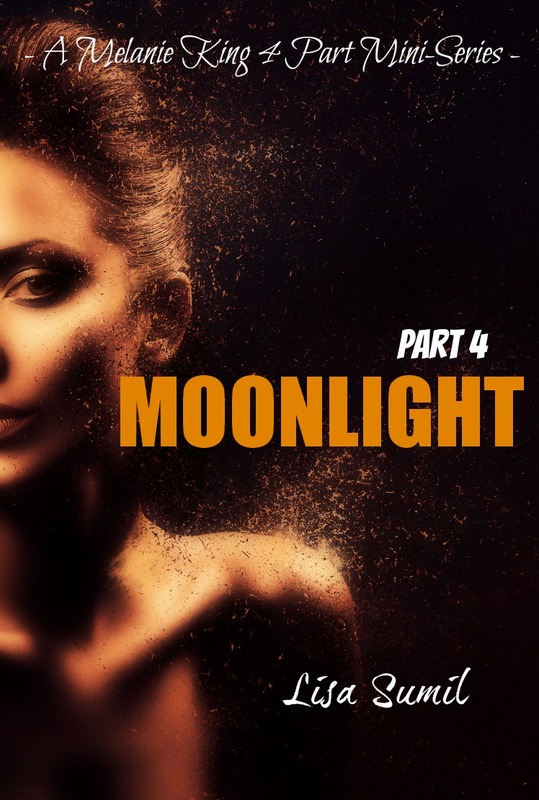 Click here to download your free copy of the first book in the Moonlight mini-series! This entry was posted in Giveaways, Lisa Sumil and tagged Free book, free kindle, moonlight. Bookmark the permalink. Moonlight 3 – Cover Release! This entry was posted in Lisa Sumil and tagged adult romance, cover release, erotica, lisa sumil, Moonlight 3, new adult romance. Bookmark the permalink. Warren hailed the cab and he took my hand in his as we sat in the back seat. His wedding band reflected the light like an ominous beacon. I twirled it under my thumb so it spun around on his finger. He looked at me curiously. “How many?” I whispered, wondering if he knew what I was asking. From the corner of my eye I saw the cabby glance up quickly into his rearview mirror and I self-consciously lowered myself further into the plastic seats. I shook my head. And it was true. I wanted it more than anything and I couldn’t see myself turning back. This entry was posted in Lisa Sumil and tagged adult romance, author t.m. williams, erotica, lisa sumil, moonlight, t.m. williams, tina marie williams. Bookmark the permalink. Moonlight will be on Amazon in the AM! This entry was posted in Lisa Sumil and tagged amazon, erotica, lisa sumil, melanie king, moonlight, romance. Bookmark the permalink.